Interim President Oleksandr Turchynov has since vetoed that repeal, but the episode has alarmed many of Ukraine’s Russian speakers and others. “Just as the law itself was meant to validate the continued use of Russian in Ukraine for a wide range of activities, the move to cancel that law was perceived as taking away rights enjoyed by the Russian-speaking population, and potentially a sign that there might be growing discrimination against them,” explained Olga Oliker, a security and defense analyst at the RAND Corp. Indeed, after the 2012 law was passed, 13 of Ukraine’s 27 regions, mostly in the industrial eastern parts of the country, quickly adopted Russian as a second official language. (But even then, the passage of the law triggered demonstrations in the streets and even fistfights in Parliament.) Dr. Vitaly Chernetsky, associate professor in the department of Slavic languages and literatures at the University of Kansas, commented that the 2012 language law was poorly written and roundly criticized by many experts at the time. “Additionally, no budgetary allocations were made at the time, so passing this law was, in effect, a purely symbolic measure intended to divert the attention of the Ukrainian electorate from corruption and economic problems,” Chernetsky said in an interview. According to the CIA/World Factbook, the Russian language is spoken by about one-fourth (24 percent) of the Ukrainian population, while about one-sixth (17.3 percent) of the Ukrainian population are ethnic Russians. RT, a Russian television network, claims that 40 percent of Ukrainians speak Russian, (presumably including non-Russians). Russian speakers are concentrated in the southern and eastern parts of Ukraine – while in the southern autonomous region of Crimea (where the Russians have had a naval base on the Black Sea for more than 200 years), an estimated 60 percent of the population are ethnic Russians. The Ukraine Parliament reportedly will consider yet another language law in the coming weeks or months – it is unclear if it will again allow a multi-language framework for the country’s social and political life. Svitlana Melnyk, a lecturer in Slavic languages and literatures at Indiana University-Bloomington, argued that the establishment of monolingualism formed a key part of solidifying Ukraine's national identity. "For post-Soviet independent countries and Ukraine in particular, the state language has symbolic meaning and a great symbolic value in the process of nation-building,” she said. “This is a national symbol along with the flag and anthem. The language issue is highly politicized in Ukraine, and its future management heavily depends on the evolving political situation." Melnyk added that she thinks that Ukrainian should be “the only state language” in the country. “At the same time, the [new language] law should consider the current socio-linguistic situation and protect the languages of national and ethnic minorities in the country," she said. Separately, in response to the gathering storm in Ukraine, some nationalist lawmakers in Moscow, led by the far-right Liberal Democratic Party of Russia, have called for the fast-tracking of Russian citizenship to ethnic Russians in Ukraine. LPDR MP Ilya Drozdov has already tabled a bill that would grant Russian citizenship to Ukrainian-Russians within six months of proving their ethnicity. “The adoption of this amendment would allow [us] to lawfully use the migration potential of Ukrainian citizens of Russian ethnicity who desire to get Russian citizenship,” Drozdov explained. RT reported that more than 2 million residents of the former Soviet republics have received fast-tracked Russian citizenship since the fall of the Soviet Union – even including people not of ethnic Russian origin, like the South Ossetians of Georgia, who speak an Iranian-related language. Meanwhile Ukrainian nationalists, particularly members of the ultra-right Svoboda (Freedom) party led by Oleg Tyahnibok, have even threatened to ban the Russian language completely and even strip the Ukrainian citizenship of the nation's Russian speakers. Jean Asselborn, the foreign minister of Luxembourg, in a meeting with his Russian counterpart Sergei Lavrov in Moscow, expressed their grave concerns about another Svoboda-proposed bill that would essentially ban all Russian language media in Ukraine (which Svoboda has defended by citing that Russian reports of the turmoil in Ukraine have been tarred with bias). That bill would prohibit from Ukraine any media from nations that have not ratified the European Convention on Transfrontier Television -- Russia has signed the convention, but has not ratified it yet. “Russia is not a party to the convention, but it does not prevent us from broadcasting all across Europe. No EU member makes any problems for our broadcasts. If such a decision is taken in Ukraine, it would be a serious violation of the freedom of speech,” Lavrov said at a media conference. Russian and Ukrainian are closely related Slavic tongues, but they are also distinct languages with separate ethnic and national identities. 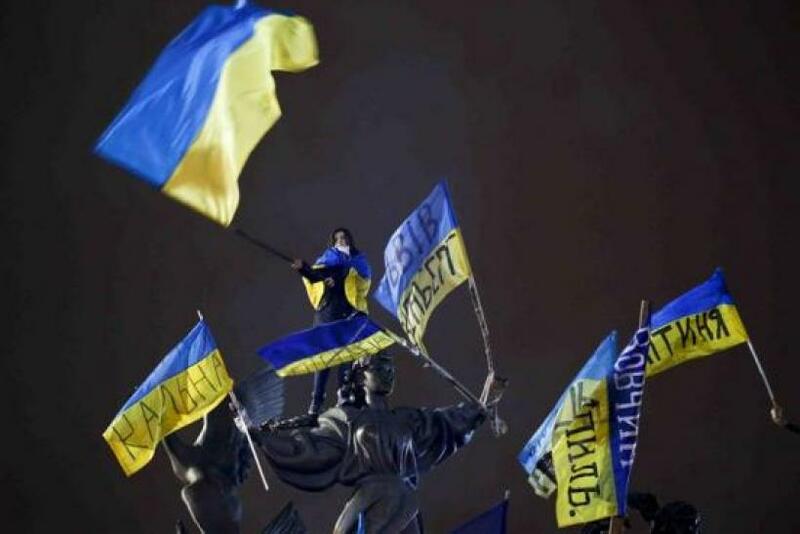 The Christian Science Monitor reports that Russian-language activists in Ukraine have long wanted to make Russian a second official state language, citing such scenarios in multi-lingual countries like Canada and India. “There is this pervasive suggestion that if you speak Russian, you’re not a loyal or true Ukrainian. This makes Russian-speakers feel like second-class citizens,” Ruslan Bortnik, vice chairman of Russian-Speaking Ukraine, an advocacy group, told the Monitor. Of course, Ukrainian nationalists fear the further encroachment of Russian into its national fabric. “If Russian were an official language, the main fear is that it would be a wide-open door for Russian influence in Ukraine,” said Oleksiy Kolomiyets, president of the Center for European and Transatlantic Studies in Kiev.